Tookany/Tacony-Frankford Watershed Partnership Inc (TTF) is charged with protecting and improving the quality of the water in our TTF watershed. 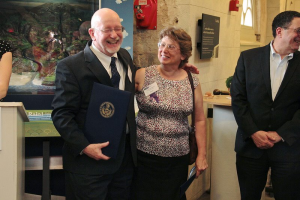 The Second Annual Watershed Milestones Award Ceremony, held at Philadelphia Water Department’s Fairmount Water Works Interpretive Center honored people, organizations, public agencies, and companies whose work improves the health of the TTF. 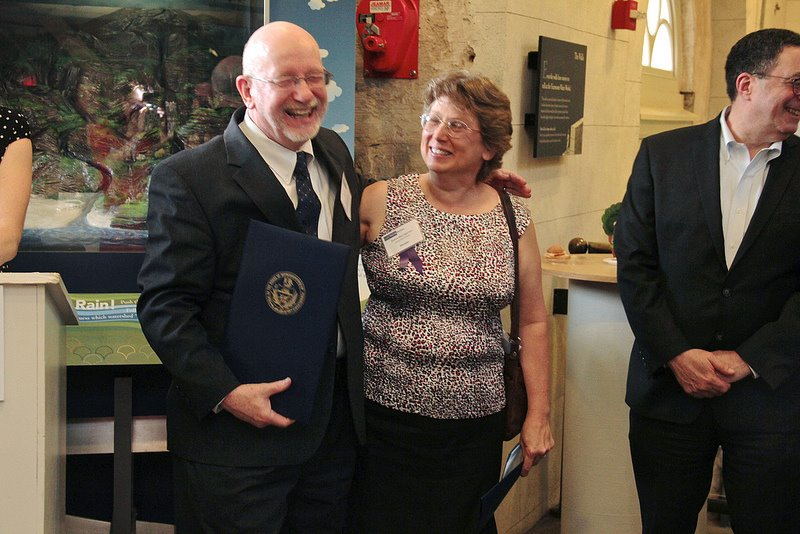 I’m thrilled to receive the Tookany-Tacony/Frankford (TTF) Watershed Association’s Watershed Educators Award for 2013. It is an honor to be working along with all of the others who are making a difference as we work to improve the health of our watershed. The honorees include Denise Eiler, Watershed Educator from the Baldi School; Abington School District, Roots to Re-Entry (Pennsylvania Horticultural Society), and Abington Township Environmental Advisory Council as Friends of the TTF Watershed; Aliyah Patterson as TTF Youth Champion; Cheltenham Township as TTF Watershed Municipal Leader; and The Sustainable Business Network of Greater Philadelphia as Private Sector Steward. Working across Municipalities and Townships, we are making a difference! TTF arranged for each honoree to receive a Pennsylvania House of Representative Citation from our Representative. State Representative Steve McCarter, a neighbor and friend, personally gave the Citations to those of us in his District. TTF recognizes Dottie Baumgarten for her passion and dedication as a watershed educator committed to improving the health and vitality of our watershed. 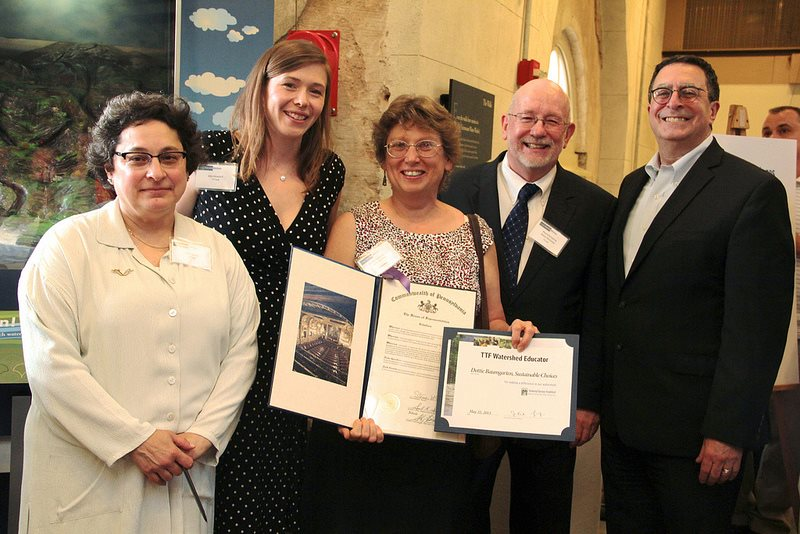 She worked closely with Cheltenham Township, the Partnership for Delaware Estuary, and TTF to create and develop the Clean Water Partners program to educate and engage businesses on stormwater management. * The Montessori School in Dresher, PA is also part of the my work, where I teach Sustainable Science. It is in the Wissahickon Watershed. So I’m really a geek scientist at heart. For all the effort I put into teaching and creating the right scenario for reaching the public with accurate science, the heart and soul of my efforts are rooted in the hard science of my college chemistry days. I was in heaven at Cape May, New Jersey earlier this week. Partnership For the Delaware Estuary feels like my home, and 2013 Delaware Estuary Science and Environmental Summit is my family reunion. Yeah, I may be that odd-ball educator of younger than college people, but I’m still family. And what a reunion! You know that major problem of Hurricane Sandy? Well there are folks who are looking at how we as a society can respond. Don’t quote me on the details exactly. I’m going to get some exact names and organizations miss-stated. But between EPA, DEP PA, DEP NJ, Army Corps of Engineers, USGS, DNREC, Rutgers, PWD, UDEL, DRBC, and a dozen other private and public entities, this scientific community is striving to find and document the information on how things are going and recommend what we can do about it. Flooding in Delaware? Someone is looking at whether it would cost more to society to let it go as nature dictates, fight it with tooth and nail (and fail), or to plan out and assist a stepwise retreat. You know what? It will cost society less if the powers that be put money into a planned retreat. New discovery? There are fresh water mussels throughout the Delaware River system. If there is a gravel bed under two feet of water, scientists and volunteers are consistently finding colonies of mussels. This is HUGE news because the mussels are filter feeders, and they are and have been cleaning the river water. Cheer! Celebrate! Join a volunteer mussel survey in your local river so that the big guys can plan where to collect seed mussels. Then they can determine where the habitat is healthy for starting new mussel beds. In the big picture of polluted water, expanding mussels in the riverbeds will move our clean waterways up to the next level of health. Communication? Scientists know how to communicate with each other but get a failing grade on communicating their information to the general public. That’s my niche, found and identified. Put this science information in perspective, find the best message connected with an action, and help people change their behavior. Help you change your behavior. Catch you later. Maybe at my collaborative STEM/Sustainable Science class looking at stormwater on a school campus. Here in the Delaware River Watershed, we are all experiencing excessive rainwater this year. This Climate Change is likely here to stay, so we need to figure out how to deal with the amount of rain that will likely continue for the next couple of decades. There are great resources available for homeowners and businesses. Tookany Tacony Frankford Watershed has a resource section that can be downloaded. Partnership for the Delaware Estuary also has excellent resources. Look for their recent newsletter on flooding. I will be talking on this topic to businesses in Cheltenham three times during the month of October. Space is limited, so if you are not from Cheltenham, but would like to attend, please contact me first. Business Owners: Learn current information on how to reduce stormwater pollution and reduce stormwater volume flowing from your property. Gain insight into best management practices for cleaning outside, storing materials, washing vehicles and retaining water on your property by using rain barrels or a varitey of other natural water holding options. These workshops can be repeated at your location.